Handley Cellars is a small family-owned winery located in the "deep end" of the Anderson Valley on the 59-acre historic Holmes Ranch with its house, barn and iconic water tower. There are 29 acres of certified organic estate Pinot Noir, Chardonnay, and Gewurztraminer in the Handley Estate Vineyard, with original plantings dating to 1986 and 1987. 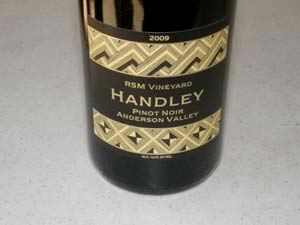 Handley also has 8 acres, named the RMS Vineyard after her late husband, Rex S. McClellan, which she planted around her house from 1999 to 2001 containing Pinot Noir and Pinot Gris. Owner Milla Handley has been making nicely balanced, food friendly wines since 1982. She moved to the Anderson Valley in 1978, three years after graduating from University of California at Davis with a degree in fermentation science. Her early winemaking training was with Richard Arrowood at Chateau St. Jean and Jed Steele at Edmeades. 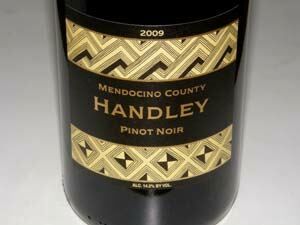 The Pinot Noirs are nicely weighted, not overly extracted, and fresh in character. A superb sparkling wine is also offered and the winery is well known for its Alsatian white offerings as well. Beginning in 2004, the co-winemaker was Kristen Barnhisel who holds a Master's degree in Enology from University of California at Davis. After many years, she left and was replaced by Randy Schock. In June 2017, Milla announced that after 40 years of winemaking she was retiring to make way for the third generation of family winemakers. Milla's daughters, Lulu McClellan and Megan Handley Warren, will be co-owners of the winery. Former co-winemaker Randy Schock will be promoted to lead winemaker. The tasting room on Highway 128 adjacent the winery is tastefully decorated with Milla's family art collection and a welcoming outdoor patio offers a pleasant respite. Can't go wrong with any of the wines here. Case production is 12,000 annually, which has been pared back from a high of 18,000 a few years back.